In the comments section of a previous article I wrote for Seeking Alpha, several readers commented positively on SPHD. Due to SPHD's .30% expense ratio, I had not previously considered this ETF. While I feature low expenses as a solid anchor for your portfolio, attractive options shouldn't be ignored. In this article, I first introduce you to SPHD. I next run an interesting comparative backtest. Finally, I evaluate SPHD against the ETF featured in my last article. SPHD has an inception date of 10/18/12 and AUM of $3.23 billion. While, as featured above, its .30% expense ratio is relatively high for a large-cap ETF, it offers excellent liquidity for a somewhat specialized fund. With an average daily trading volume of $33.9 million, it sports a solid .02% average spread. SPHD tracks the S&P 500 Low Volatility High Dividend Index, provided by S&P Dow Jones Indices LLC. The criteria for inclusion in the index are very interesting. Let's take a look. As shown above, starting with the S&P 500 index, the initial screen seeks the highest dividend-paying companies by first screening for the highest 75 dividend-yielding securities in the index, over the past 12 months. From that first screen, then, comes the "high dividend" component found in the ETF's name. What, though about the "low volatility" component? A clue is found in the 3rd box from the left in the above graphic. Let's let Invesco explain it in their own words. 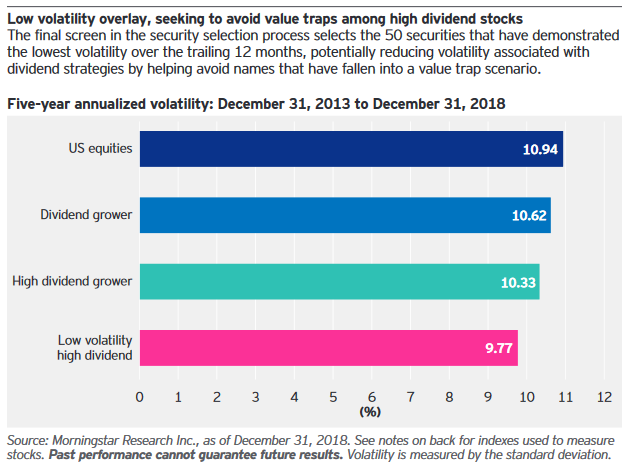 The final screen in the security selection process selects the 50 securities that have demonstrated the lowest volatility over the trailing 12 months, potentially reducing volatility associated with dividend strategies by helping avoid names that have fallen into a value trap scenario. And the results? Take a look. Next, let's take a look at SPHD's sector weightings and then I will offer a couple of important observations. If you dig in a little bit, you will notice a couple of key differences between SPHD's sector weightings and those of several other high-dividend ETFs, such as the three I featured in this 'ETF Monkey Focus' article. 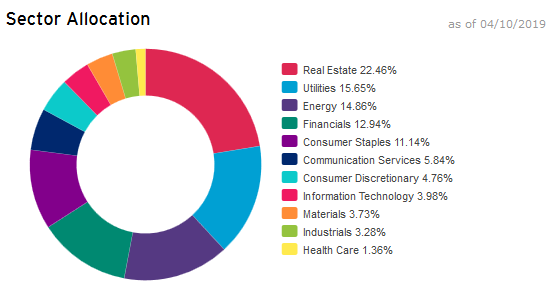 First, In SPHD, the sector with the largest weighting is REITs, at almost a full 25% of the fund. You will see that REITs are not even present in the three ETFs from that earlier article. Second, at 15.65%, Utilities are weighted much more heavily than the other three ETFs which, at the time of that article's writing, comprised between .50% and 7.80% of their holdings. This might be a good time to mention one tax consideration. As I have shared in several previous articles, dividends from REITs do not benefit from preferred tax rates, as do dividends from most common stocks. So, if you hold SPHD in a taxable account just be aware that roughly a quarter of your dividends may be taxed at a higher rate. 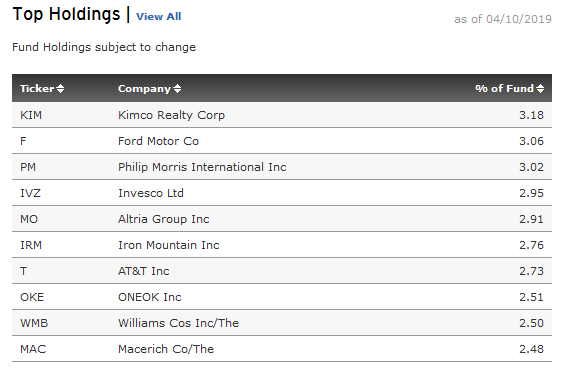 With that, a quick look at SPHD's Top 10 holdings. Lastly, before I leave this section, I want to point out one more thing I love about SPHD. Namely, that it pays monthly dividends. Particularly if you are a retired investor, and a steady stream of monthly income is desirable, take a look at SPHD! At the outset of the article, I admitted that I had not taken an in-depth look into this ETF because of its expense ratio. What got me to take a look at it now? Simply put, it's performance. To give you some idea of how well it has performed, here are the results of a little comparison I built in Portfolio Visualizer. You will recall that I featured the inclusion of REITs and Utilities as a difference between SPHD and several other ETFs that might be considered competitors. So, I built a little comparison whereby I built a 3-ETF portfolio consisting of the Vanguard High Dividend Yield ETF (VYM), the Vanguard Real Estate ETF (VNQ), and the Vanguard Utilities ETF (VPU). Take a look at the parameters for my test. Noticing that SPHD has roughly a 23.00% allocation to REITs and a 16.00% allocation to Utilities, I assigned those same weights to VNQ and VPU, respectively, and then filled the rest with VYM. The backtest covers the period from January 2013 to the present (limited by SPHD's inception date). All dividends were reinvested and each portfolio was rebalanced annually. Let's see how it played out. Admittedly, this is not a perfect 'apples to apples' comparison since, for example, VYM has a 7.80% weighting to Utilities in its own right, However, it may serve as a helpful point of reference with which to evaluate SPHD's performance. I think you would agree that SPHD comes out looking very good. Its CAGR was a full 1.4% higher than my mini-portfolio, with a very minor standard deviation penalty and an even lower max drawdown. In summary, all of this contributed to superior Sharpe and Sortino ratios. Finally, in the introduction to this article, I featured that my interest in SPHD was triggered by reader comments in response to a review of what I called the "best 2019 ETF for dividend growth investors." That article featured the iShares Core Dividend Growth ETF (DGRO). Just for grins, as a "bonus," here is a comparison of those two ETFs side by side. All the parameters are the same as the first backtest, except that the period is a little shorter, from January 2015 to the present (limited by DGRO's inception date). Portfolio 1 is 100% SPHD and Portfolio 2 is 100% DGRO. Interestingly, over this 4+ year period, the overall return from the two ETFs was almost identical, with DGRO squeaking out the 'win' by a mere $192. At the same time, you likely noticed that DGRO's volatility was slightly higher and that, at least over this period, SPHD offered slightly better Sharpe and Sortino ratios. All told, then, this simply confirms SPHD as worthy of your inspection. As always, I truly appreciate the feedback from readers in the comments section of my articles. In this case, a couple of such comments led me to take a closer look at an ETF which I had not previously evaluated. In summary, while I would be even more excited if Invesco could find a way to decrease SPHD's expense ratio, the unavoidable conclusion is that it deserves serious consideration for inclusion in your portfolio. Remember the caveat regarding taxes that I offered above, if considering it for a taxable account. However, SPHD's combination of solid performance, relatively low standard deviation, and superior Sharpe and Sortino ratings, make it worthy of serious consideration. Disclosure: I am/we are long VNQ, VPU. I wrote this article myself, and it expresses my own opinions. I am not receiving compensation for it (other than from Seeking Alpha). I have no business relationship with any company whose stock is mentioned in this article. Additional disclosure: I am not a registered investment advisor or broker/dealer. Readers are advised that the material contained herein should be used solely for informational purposes, and to consult with their personal tax or financial advisors as to its applicability to their circumstances. Investing involves risk, including the loss of principal.